Foot Impulse Sealers are available on this page in lengths from 24" to 35" long and seal widths from 2mm to 10mm. 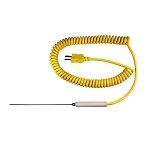 Impulse sealers fire a short impulse of electricity through a specially designed heating element to seal the open end of bags. The length of the seal time will depend on the type and thickness of the bag. 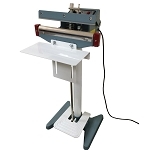 The foot sealers on this page are 24" to 35" in length and have seal widths from 2mm to 10mm. Use the wider seal widths for the more robust liquid tight seals needed for food products.